We all know that the twelve members of the FOMC (the Federal OPEN Market Committee) meet eight times a year in private to decide what their OPEN market operations will be in the interim between meetings. The FOMC was created two months after the gold confiscation of 1933 by the Banking Act of 1933 (also known as Glass-Steagall) at the height of the banking crisis. The hope was that it would stabilize the banking system. The FDIC was also created by that same act. And we also know that at the latest FOMC meeting on March 17-18 they decided to begin OPENLY purchasing long-term Treasury securities, up to $300 billion worth. This is the boldest OPEN market operation ever, as it signifies an open monetization of official US debt even if its stated purpose is to help the housing market by lowering interest rates. The FOMC will meet again next week on April 28-29. So I think it is fairly safe to say that OPEN market operations have hit historic levels in the past 6 months. But what about COVERT market operations? I want to avoid sounding like a conspiracy nut here, so I will focus only on the facts. In an October 27, 1989 article in the Wall Street Journal titled "Have Fed Support Stock Market, Too", a former Federal Reserve Board member Robert Heller opined that "Instead of flooding the entire economy with liquidity, and thereby increasing the danger of inflation, the Fed could support the stock market directly by buying market averages in the futures market, thereby stabilizing the market as a whole." In a January 1997 speech given in Belgium, Alan Greenspan said the Fed could use "direct intervention in market events." In a 2006 London Telegraph article titled "Paulson Reactivates Secretive Support Team to Prevent Markets Meltdown", George Stephanopoulos, former Clinton aide is quoted saying the Working Group has "an informal agreement among the major banks to come in and start to buy stock if there appears to be a problem." In 2001, the London Observer reported that "the Fed, supported by the banks, will buy equities from mutual funds and other institutional sellers if there is evidence of panic selling in the wake of last week's carnage." In March 2002, the FT quoted an anonymous Fed official saying the Fed was considering "buying US equities", and that they could "theoretically buy anything to pump money into the system", including "state and local debt, real estate and gold mines, any asset." Now I'm sure that there is plenty that goes on behind the scenes within the hallowed chambers of Wall Street and Washington, DC. But I have identified three main periods of market activity during the past year that have a particular stench. July 11, 2008 – INDYMAC bank is seized by the FDIC. July 14, 2008 - This document is signed by the Comptroller of the Currency and the Director of the Office of Thrift Supervision. July 15, 2008 - It is also signed by the Secretary of the Federal Reserve and the Executive Secretary of the FDIC. July 16, 2008 – The above document is released which tells banks how much capital they must have. This is an international issue known as the Basel II Accord. It requires banks to be properly capitalized or else foreign (European) banks will be forbidden from doing business with them. These guidelines must be met by the end of the fiscal year, 2008, which is September 30, 2008.... TODAY! July 15, 2008 – Gold again peaks, stocks hit new lows, and the PPT along with the world's Central Banks go into action. For the next two (2) months, stocks go up, the dollar goes up, and gold goes down. This is a massive intervention effort to give the remaining banks a chance to get in compliance with Basel II. To get recapitalized. Which didn't quite happen like they hoped. Notice how the primary impetus behind the supposed USTBond rally was the mountain of purchases this past autumn by the USGovt and UKGovt, as seen in the Caribbean banks, where their fingerprints are often found without any mention in the press whatsoever. The US & UK illicit games conducted in Caribbean banks is given cover from hedge funds and Arab accounts, but not enough to hide what is really happening. In July 2008, the Caribbean bank center ledger item showed $117 billion in USTreasurys. By October 2008 the amount zoomed up to $204 billion. This is not Bermuda and Bahamas redeeming sea conch shells, molasses barrels, and salvaged marine vessels for USTreasury Bonds. These are games played by the syndicates running the central banks. The bigger question is whether USTBonds were purchased with newly printed money. Clearly they were in my view. Indeed, Jim, this is the biggest question of all. The third and final questionable period I will highlight started March 9, 2009 and continues today. It is the ongoing stock rally in midst of a really ugly reality. GS traded more than 50% of all trades initiated FOR THEIR OWN ACCOUNT, but that volume (1B shares) was 20% of the total traded on the exchange. As in everyone. 1 in 5 trades on the exchange were initiated by Goldman for their own benefit. [First Comment (deleted)]: It's just an article from years ago confirming the PPT. I didn't read it but here is the real truth. These days there is no single entity, rather there are 6 large hedge funds located in the Reston Virginia, and DC area who are the commercial accounts. The commercial accounts take their direction from either the Treasury or Fed depending on which branch has the lead. 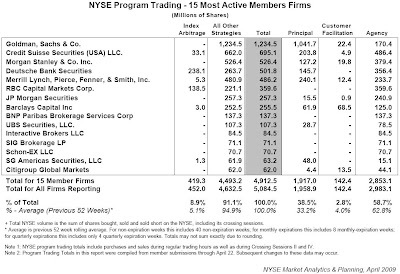 These hedge funds are the ones placing large orders to GS, JPM, etc... Market moving orders. So when you hear that 'paper is buying' large quantities on the floor you cannot really tell who it is and all you can do is speculate. It looks like it's coming from GS but they are just executing an order for a client. There is no trail back to Uncle Sam. Do you really think the government would go directly to GS or JPM to place orders? That is laughable. Anyway the end result is the same, you are all getting gamed. And our hero Tyler is the only one who is exposing the `real` truth so stay tuned to Zero Hedge. The big block orders(market movers) come into the pit through paper. When I ask paper(GS, JPM,etc) who are they buying or selling for there are 6 funds that always are referenced. The Reston 6. These kinds of COVERT market operations require immense sums of money to pull off. Money that certainly does not come from the sale of Treasuries if they are using it to also buy Treasuries. Think about it. "...the U.S. government has a technology, called a printing press (or, today, its electronic equivalent), that allows it to produce as many U.S. dollars as it wishes at essentially no cost." I ask you this; If they are crediting dollars electronically in order to manage the markets, what does this mean? What are the implications? Would this not be bigger than Watergate? Is this not like cheating at poker? And what about the temptations? Where is all this money ending up? Who is profiting? And who is losing? And if something like this were credibly exposed, if someone blew the whistle, what would be the consequences? What would China do? Is a market rally worth the risks? How about the possibility of a resumption of public confidence? Is that worth the risk? Perhaps only private profits are worth a risk like this, assuming it is even happening. Then again, does it really matter how this is being funded? Or is it simply the appearance of impropriety without credible explanation that really matters? Someone wise once said, "As I've matured, I've learned that it takes years to build up trust, and it only takes suspicion, not proof, to destroy it." "So how much gold does China really have?......." 1.000 ton to 5.000 ton ! 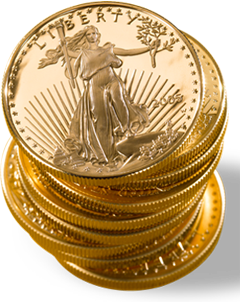 Belgian gold(scrap) recycler/refiner Umicore, states that the enormous demand for goldcoins cannot be served ! The $-regime is again buying some more time & $-goodwill with freezing the goldprice as to offer the opportunity for the global goldmetal accumulators to store their wealth (buying power). First it was to please the oil owners,...now the $-regime wants to please the dollar owners with the same gold-reserve-wealth. On the road (trail) to freegold ! Maybe we can suggest that the following should be read between the lines : Keep the brutal forces away from the exchange rates,...and let them go for the goldprice !? The floating exchange rate system as it is today, without a counterbalance, is the plague of the system. It creates a conflict of interests. On the one hand, you want your currency to be weak as it makes the economy appear strong. On the other hand, you don't want prices to rise too fast or your domestic economy suffers. In this system, currencies don't so much float as they just sink at different rates. The strong dollar policy only stretches the already-stretched rubber band even farther. When it breaks, it will be painful for those who advocated this policy. The policy of managing exchange rates requires cooperation, which is becoming more and more difficult as the crisis proceeds. The SDR talk is only a diversion in my opinion. It will ultimately end up being the survival of the fittest in the currency world. I don't see any sustainable policy suggestions coming out of these non-stop meetings. It's like a flat world convention, exchanging ideas on how to get rid of those pesky people saying the world is round. We have to give credit to Martin Armstrong. April 19th certainly did have merit as a cycle point. Now let us see what June provides. Use Alf for "Price" and "Martin" for Time." my guess is they are using the social security trust fund. getting yield higher than treasuries.